Confession: I turned off the email notifications on my phone the second I pressed “post” on my “Choose” blog. Not because I doubted a) that I was supposed to write it or b) that God’s word would stand, but because it’s really hard to get those little “comment notification” dings on your phone all day long after you’ve written a hard post and open them, one a time, with one eye squinted half-shut and your chin tucked in, not knowing whether it’s going to be an affirmation or an attack. Honestly, I expected a lot of the latter. Anytime you talk about truth, especially of the Biblical variety, they’re bound to come. Out of 80+ responses here and on social media, I received not one hateful comment. It’s probably a good thing that I don’t know most of you personally because, as much as I’m not usually a big huggy type, after reading all of the lovely, encouraging, downright inspiring things you wrote in the past few days, I’d probably be all up in your grill, making us all 50 kinds of uncomfortable. So, all that to say: Thank you. I am just as convinced as always that I have the nicest, awesomest readers ever, and I am thankful to God for each of you. Truly. What if I told you that $1 could change your life? Or at the very least your kitchen habits. Yup, that rather streaky little fella there has been a bit of a revelation in my kitchen since Mandy gave it to me for Christmas (don’t worry; that wasn’t my entire gift). But before you go diving for the comment section to give me suggestions for how to get the streaks off of it, let me expound upon this unassuming little tool’s many virtues. First, it is THEE thing (I just borrowed that spelling from the hilarious Grace of Camp Patton because, well, I just like it) for getting even the gooiest, stickiest, most baked on cookies of them all off of the pan in one neat swipe. Seriously. This may sound kind of minor, but, take it from a woman whose favorite chocolate chip cookies include bake-directly-onto-the-pan-and-never-come-off toffee bits…this is kind of a big deal. It’s an excellent stuck-on-food scraper for anything from burnt cheese to dried on eggs to…whatever. Speaking of eggs, if you ever wanted to make yourself thee (there I go again) best fried egg with no broken yolk…yup. This little miracle can do that too. And, perhaps best of all, it makes for an incredibly effective butcher block and floor scraper. I don’t know if you’ve heard, but we eat a lot of Raisin Bran around here. AKA g.l.u.e. Seriously, that stuff gets so stinking stuck on, well, everything. But especially wood and tile. But this little spatula doesn’t even blink an eye. It just goes to town, peeling all of that gluey, bran-flake mess off of any surface I’ve yet to tackle with it. So, there you have it, folks. My (and Mandy’s–she has been to known to rave about its qualities as well) pick for this week’s Mama Life Hack. Get yourself on down to your nearest Dollar Store and grab ya one. No thank you notes necessary. Oh, whoops. I just remembered what my husband would think about that idea. ANYhoo, now it’s your turn to tell me about YOUR favorite kitchen tool. 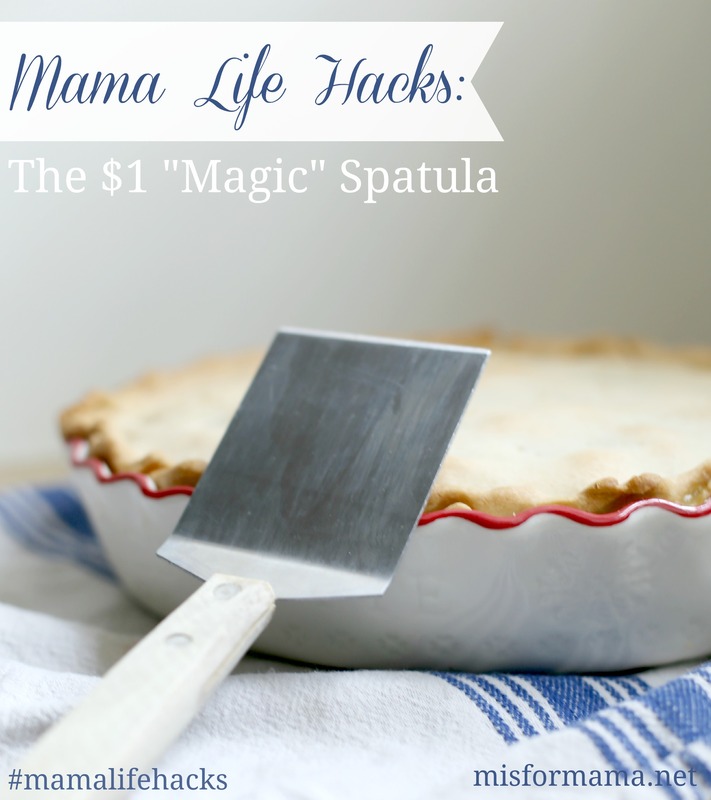 Or how to get the streaks off of my magic spatula. Or…anything else that might make all of our collective Mama-lives just a little bit simpler and more manageable. P.S. Don’t forget to tag your tips out in social media land with the hashtag #mamalifehacks. I’ve already gotten several I’m going to feature soon. P.P.S. Y’all pretty much cleaned me out on my last closet sale, but I’m about to post another round of cheap, cute closet goodies, so if that’s your thing, head on over to @mifmcloset on Instagram (for some reason, that link is not going to the instagram account, but if you search for @mifmcloset, the account will show up) and follow along for the best deals! Seems silly really, but my favorite kitchen tool is a silicon spatula. It’s heat proof, melt proof, stick on food proof and it works for just about everything I do in the kitchen. It was one of my cheapest kitchen tool purchases (I think it was a Target or Walmart buy) but I seriously need to get a couple more because it’s ggggreat! Yes! I love my similar spatulas for the same reasons, but from a DOLLAR STORE??? They have them? Not fair! I paid a whole lot more than a dollar for mine! Completely worth it though. Hamburger chopper, huh? I need to see a picture of this thing! My favorite way to make guacamole is to scoop the flesh of the avocados into a freezer zip top bag and smush it all up! Once it’s at my preferred consistency, I snip the corner and squeeze it into a bowl and stir in lime juice, salt or whatever else I want to add. You can add it directly to the bag before snipping, too, if you want. OR when avocados are on sale, you can make several batches of guacamole in the freezer ziplocks, add some lime juice and freeze! Just be sure to get all the air out of the bags and freeze flat. It freezes really well and just comes out a little tiny bit watery, but then I usually add some diced roma tomatoes and red onion and you’d never know the difference! Oh, I also use freezer ziplocks to smush bananas for banana bread/muffins, again snipping the corner to squeeze it into the batter. Plus, it’s an easy way to let my daughters help in the kitchen. And less clean up. AND it think it’s hard to smash slippery things like avocados and bananas so this makes it a lot easier and less messy. Freezer ziplocks are my bffs in the kitchen. Super smart! I love it! This one people probably already know but I always manage to forget it every other time I need it so I thought I’d just throw it out there… boil water in the microwave before cleaning… seriously there’s no scrubbing required. Stuff just wipes right off! It’s basically my favorite cleaning trick that makes me feel like super woman/mom. Hey, that’s brilliant! Definitely stealing/featuring this one! Not silly at all, Sara. I didn’t specify because I forgot to ask Mandy which one it was, but I’m pretty sure it was on where everything really is “just a dollar.” So, like…Dollar Tree and “Everything’s a Dollar.” I’m betting it would be more at Dollar General or one of the others.